We were thrilled and honoured to receive the 2019 Guides for Brides Customer Service Award for Wedding Photography on March 28th at the lovely Bodleian Library, Oxford. We were presented with our award by Judy Mansfield, owner and celebrant from Cherish Ceremonies. 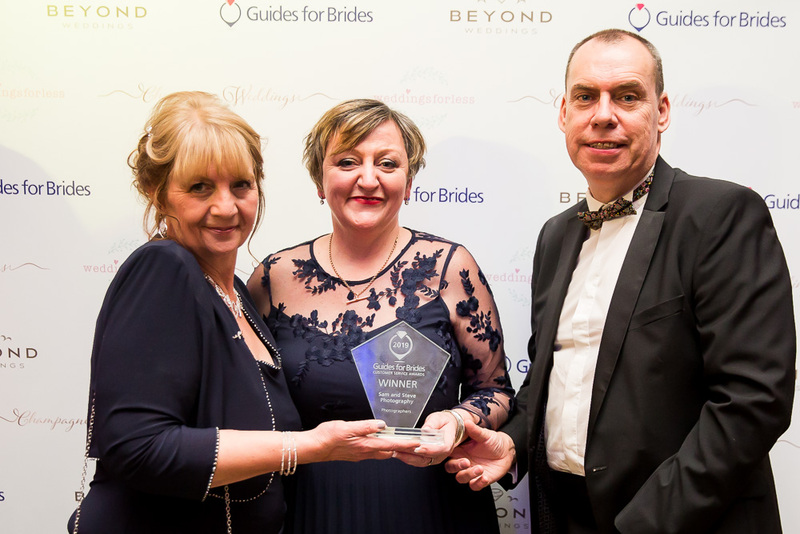 As we described in our news update last month, the Guides For Brides Customers Service Awards are a prestigious award process that is held each year, by the leading wedding industry directory and resource guide. We were shortlisted for the awards event following the 80 (at the time of writing) 5 star reviews our customers have left for us on our Guides for Brides listing , for which we are so thankful for. Over 120 owners and employees of the nominated wedding industry suppliers attended the awards event, which consisted of a welcome drink and dinner at the Weston Library (formerly the New Bodleian) before the awards ceremony across the road in the main hall of the Bodleian Library (of Harry Potter films fame). It was nice to be back at the Bodleian, having photographed a wedding there the week before. its a wonderful venue. For each category (such as venue, wedding cake, wedding dress supplier, videographer, etc) , a short list was announced followed by the presentation of the award winner. The judging took place by an impartial panel of Judy Mansfield from Cherish Ceremonies, Anthony Stears from the Telephone Assassin , and Kate del Nevo and Hannah Vinten from the Bodleian Library events team. The photography award was one of the last to be presented, which kept us chewing our nails for a little longer! We were of course delighted, and we want to thank our many friends (including fellow photographers) in the wedding supply business who came up to congratulate us. Most of all, our heartfelt thanks and gratitude to all of the lovely couples we photographed in 2018, and who voted for us. We are truly humbled; without you there would be no Sam and Steve Photography. Our thanks to John, Jackie and all the team at Guides for Brides for an excellently run evening, and of course the event team at the Bodleian. Sam and Steve Photography with the team from Guides for Brides. Photo by Nigel Chapman Photography. The full list of all winners from the evening can be found on the Guides for Brides site here.